Join our Melbourne city tour and be treated to a morning of informative commentary and colourful atmosphere exploring Fitzroy Gardens, Queen Victoria Market*, a few of our laneways and arcades and a drive through Chinatown. 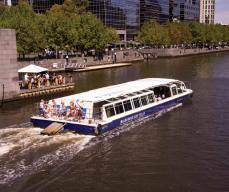 At the conclusion of our city tour, take a little walk down to the riverside to join a scenic and relaxing cruise on the Yarra River. It's also a great photo opportunity to capture Melbourne's distinct and spectacular city skyline.